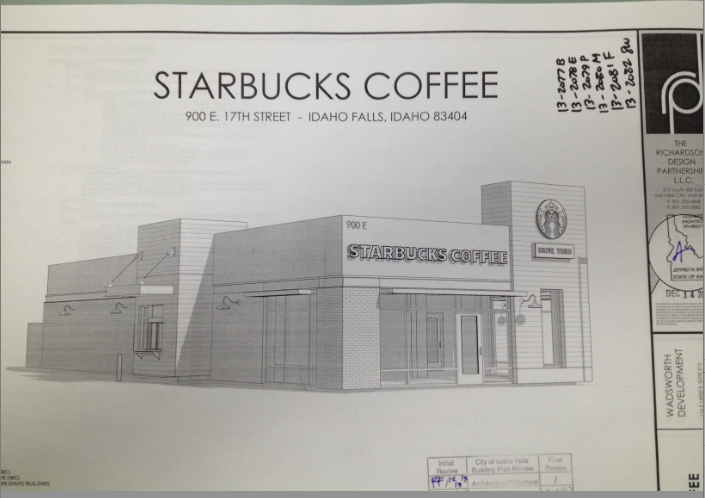 The site plan for the new Starbucks Coffee coming to Idaho Falls this year. We made our first stop of 2014 at the Idaho Falls Building Department, to wish everyone happy new year but not expecting anything too exciting. One thing that jumped out, however, was the site plan for the new Starbuck's at the corner of 17th Street and Jennie Lee Drive. The 2,158-square-foot store is being built by Wadsworth Development of Draper, Utah. Wadsworth has local involvement with Ball Ventures of Idaho Falls. In 2012 the two companies received the InterContinental Hotels Group Renovation Award for their work on the Holiday Inn Express & Suites in Phoenix-Tempe, Ariz.
We are also bird-dogging MacKenzie River Pizza, which is slated to open at Snake River Landing in the beginning of March, according to spokeswoman in the chain's headquarters in Whitefish, Mont. If you can't wait that long, their store in Pocatello opened Monday. Can't wait for demo to begin...get rid of an ugly building and get Starbucks on the east side! It's a win-win! I noticed that demolition of the old building has started.